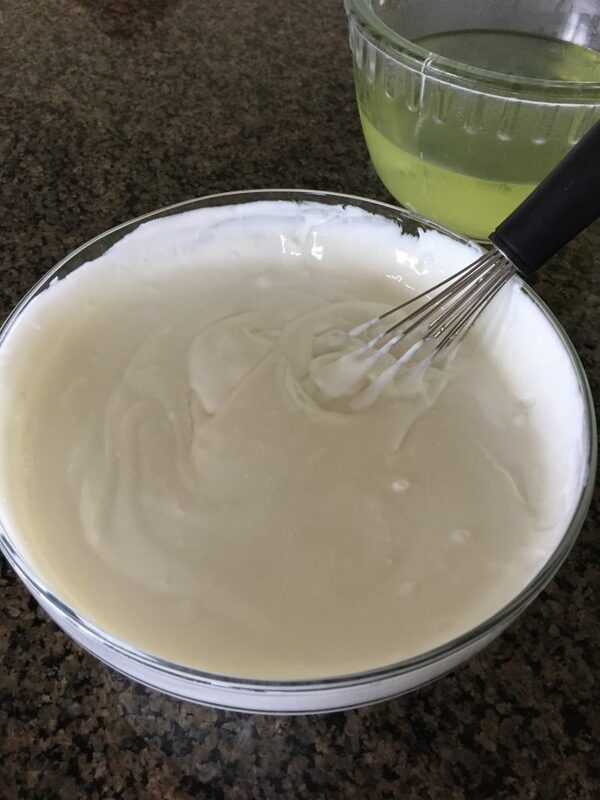 Creamy and thick Greek yogurt that you can make at home with only 2 ingredients. Step 1: Pour a gallon of milk into the bottom of your Instant Pot. Don’t use milk that is ultra pasteurized (organic milk in the U.S. is ultra pasteurized, so don’t use that). Then put the lid on the Instant Pot, you can put the valve on sealing or venting it doesn’t matter. Press the yogurt button and then press the “Adjust” button until it says “boil.” This boiling cycle will take about 45 minutes. If you want to speed up this process a little bit you can remove the lid every 10 minutes and whisk the milk. Step 2: This step is really important to getting your yogurt the right consistency so PLEASE do it right! Remove the lid and use a thermometer to test the temperature of the milk. Test the temperature by placing the thermometer in the middle of the milk, since that will typically be the coolest spot. The temperature should read 180 degrees. 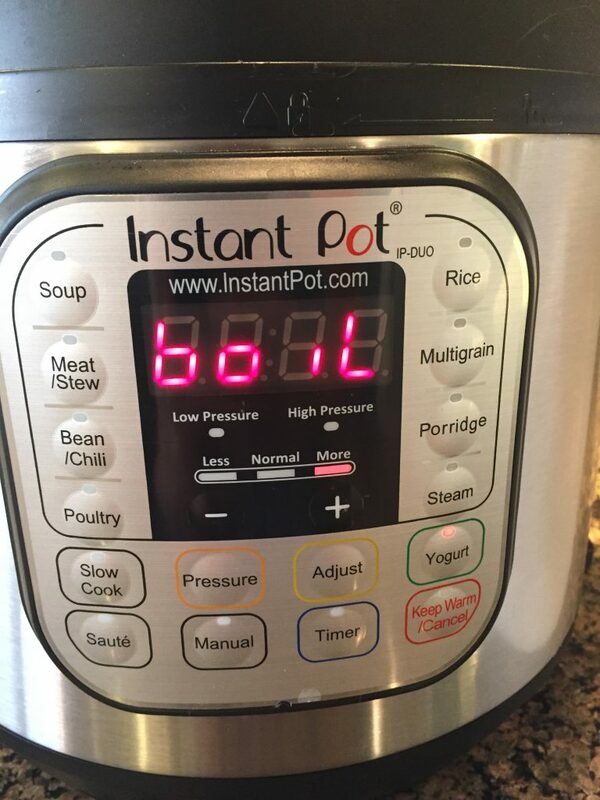 Most of the time when my pot beeps it is not at 180 degrees yet. So don’t worry if it’s only to 165 degrees. Just turn on the “saute” function and whisk the milk until it reaches the right temperature. Make sure that the milk reaches at least 180 degrees in the middle of the pot. If you get the milk to 183-185 degrees and hold it there for 3 minutes it will give you a thicker yogurt (which is what I really like). Step 3: Once the proper temperature has been reached you need to cool the milk down to 100 degrees. I do this by putting the stopper in the bottom of my sink and filling it with ice and cold water. Then I place the pot in the sink and whisk the milk, so that it cools down faster. The cold water surrounding the pot will cool the milk fairly quickly. This step probably takes about 10 minutes. Once again, make sure to whisk the milk pretty much the whole time and to take the temperature from the middle of the pot. 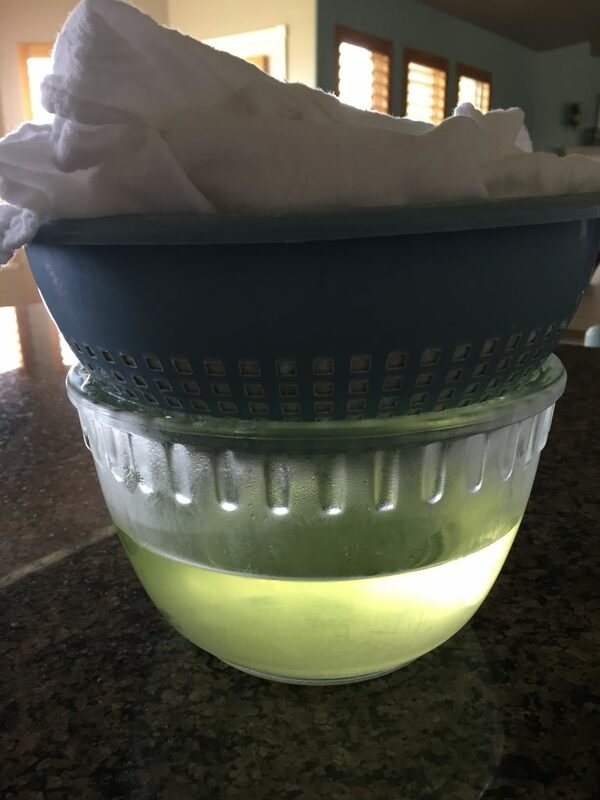 Remove the pot from the sink and dry off the outside of the pot with a towel. Get a little bowl (like a cereal bowl) and add 2 Tablespoons of yogurt (that has been made with milk and live active cultures only) to the bowl. Add in about 1/2 cup of the milk into the cereal bowl. Whisk until smooth. Now stir that mixture back into the pot and whisk thoroughly. Step 4: Place the pot back into the Instant Pot and cover it with the lid. Press the “Yogurt” button and hit the adjust button until the display says “8:00.” Yes, this means 8 hours. Sometimes I do this step overnight while I am sleeping. The timer will start counting up, not down. When the timer beeps remove the pot with the lid on and place it in the refrigerator. Keep it covered in the refrigerator for 6-8 hours. Step 5: Remove the lid and you should have a yogurt! However, if you want Greek yogurt you’re going to have to strain out the whey. I don’t like super thin runny yogurt so I always make mine into Greek yogurt by straining it. Greek yogurt is simply regular yogurt that has been strained. The way that I do this is by getting a colander and placing a double layer of those thin white flour sack towels on top. Then I place the colander on top of a bowl and spoon the yogurt into the towel covered colander (see picture below). 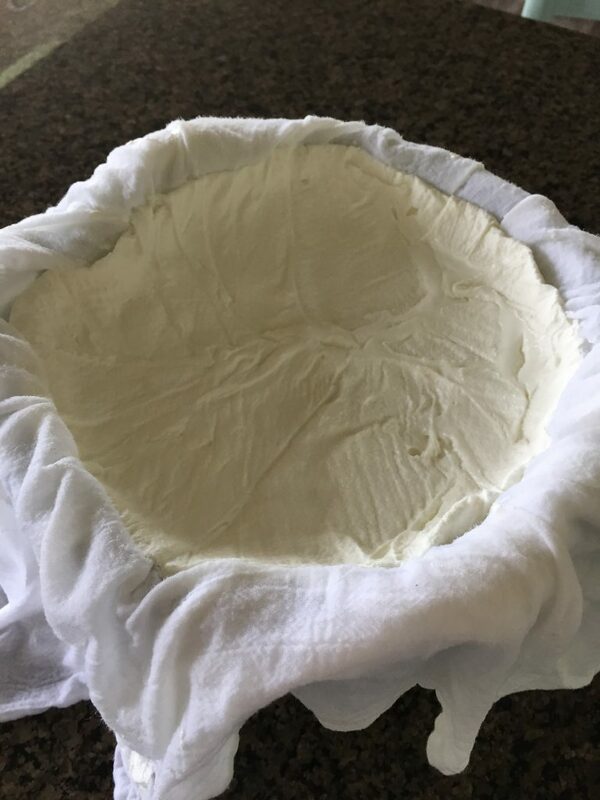 You can also use layers of cheesecloth for this step or a Euro Strainer. The whey should be CLEAR! If it is cloudy you need to add another layer of towel or cheesecloth. You’ll be shocked at how much liquid comes out of the yogurt!! It is seriously crazy. But give it time. I know, I know more time!! I love very thick yogurt so I strain mine for up to 6 hours. However if you don’t want it as thick you can have it fairly good to go in about 2 hours. Basically it’s always easier to add more liquid back in if it gets too thick than it is to take the liquid out. That’s why I go the long route on this step. Step 6: Carefully transfer the yogurt to a large container that has a lid. I like to keep mine in a rubbermaid container or a deep Glad container. Then whisk it. Whisk it until it is smooth and creamy. At this point if it is too thick you can add in a little more whey. Refrigerate and enjoy! 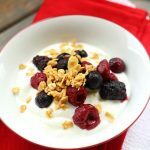 I love eating my yogurt with some fresh berries or peaches, a little sugar and some granola on top.